Here are two records by Ray Noble and his Orchestra that were issued on Victor in 1935 after Noble had relocated from England to the USA where he spent the rest of his career. The first record features two songs from the Noël Coward musical review Words and Music. Both recordings were originally issued in the UK in 1932 on the HMV label. 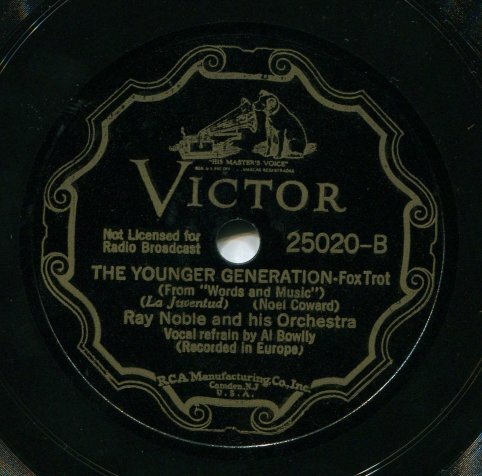 Al Bowlly provides the vocal on “The Younger Generation. This recording of “Mad About The Boy” is an instrumental. 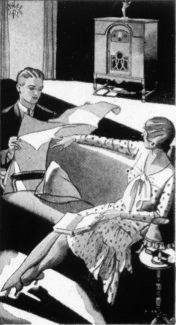 Later in September, 1932 the Noble band made another recording of the song with Noël Coward himself providing the vocal. That recording, however, was not issued at the time – though it has subsequently been made available in CD collections. The second record features the American band that Glenn Miller recruited for Noble after he moved to the USA in 1934. The only carry over from Noble’s British band was Bill Harty, Noble’s drummer and manager. This entry was posted in 1930s, 1930s Popular Music, American Recordings, British Recordings, Electrical Recordings, Uncategorized. Bookmark the permalink.